Timber is increasingly being used as a primary building material. Timber is available in many forms, from treated larch used for fencing though graded timber for construction to high quality softwoods used for cladding together with a new generation of modified woods. There is so much choice and availability that it is becoming the building material of choice. Not only is timber versatile in the way it can be used it is also sustainable, relatively inexpensive and attractive. It is already being used to build skyscrappers in various cities around the world from Vancouver to Vienna. 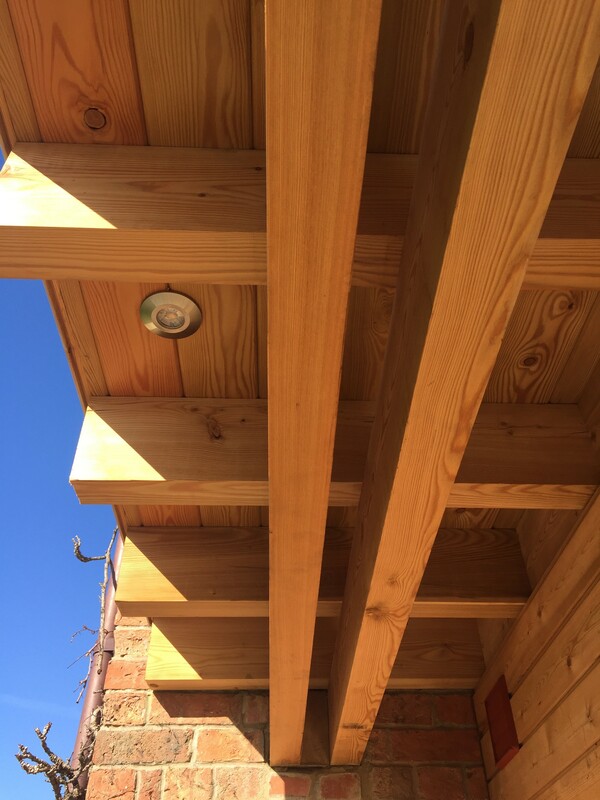 We think that timber is an amazing resource to use, this porch was built entirely with timber using Siberian Larch for the frame, joists and cladding and plywood was used for the roof deck which was then overdrawn by zinc. The photo shows some of the detail with recessed LED spotlights situated in the roof soffit.